When John Nelson gives the downbeat to Bach’s epic St. Matthew Passion at Saint Vincent de Paul Parish in Lincoln Park Wednesday night, the American conductor hopes that a new Holy Week tradition in Chicago will begin. Soli Deo Gloria was created to commission and promote sacred music of the Judeo-Christian tradition — both the great traditional choral works and new music from living composers. “Sacred music has always been the center of my world,” said Nelson. “But when you look at the 20th century, you find very little that is in the repertoire. You can count the major [sacred] pieces on five fingers — the War Requiem, the Symphony of Psalms. In the 19th century and the further you go back, you find much more sacred music — music that has addressed the spiritual issues in the world. Though SDG is more focused on commissioning new sacred works than presenting performances, Nelson felt it would be a worthwhile initiative to found a regular Holy Week Bach series in Chicago. The inspiration comes from the similar concerts he presented at Notre Dame Cathedral in Paris during his decade as music director of the Ensemble Orchestral de Paris. Hence the Chicago Bach Project. The project will also help to reestablish Nelson as a regular podium presence in Chicago. 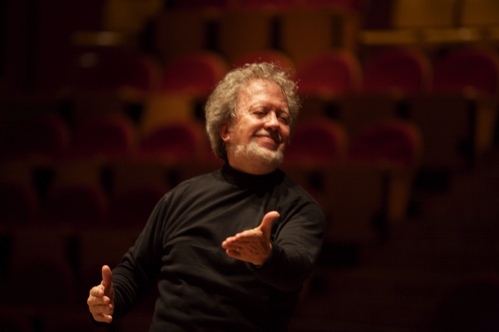 The conductor was a Lyric Opera roster mainstay in the 1990s, in the pit for performances of Xerxes, Faust, Idomeneo and Romeo et Juliette; his most recent Lyric appearance was conducting the celebrated 1999 production of Handel’s Alcina with Renée Fleming and Natalie Dessay. Regionally, he was also highly regarded for his tenure as music director of the Indianapolis Symphony Orchestra from 1976-1987. Nelson has assembled an impressive lineup of soloists for this Holy Week performance, drawing singers he has worked with before who appreciate what he brings to this corner of the repertoire. One practical challenge for the St. Matthew performance in Chicago, as in Notre Dame, is dealing with the boomy nature of a vast cathedral acoustic. “Here there’s about a four-second reverberation,” said Nelson. “In Notre Dame it can get up to 6 or 7 seconds. So it’s tough. The first time we played there it was so disorienting I thought maybe we made a mistake. Also, unusually for a non-opera, the German text will be projected on supertitles. “Everyone will be able to see the text rather than looking down at the program in a darkened sanctuary.” he said. The orchestra players are drawn from the ranks of the Chicago Symphony Orchestra, the Lyric Opera Orchestra, Music of the Baroque and top area freelancers, with many chorus members also coming from the Lyric Opera and CSO choruses. “They’re all good, very experienced singers that don’t sing with much vibrato,” said Nelson with a laugh. While the Chicago Bach Project is a personal initiative for Nelson, the main goal of Soli Deo Gloris is to commission new sacred music “to address the spiritual issues of our time within the Judeo-Christian tradition.” With a recent grant from the Lilly Endowment, SDG is currently on a two-year project commissioning new works from fifteen composers. The most celebrated SDG commission to date has been Christopher Rouse’s “gargantuan” Requiem, premiered in Los Angeles in 2007. Other commissioned composers have included Arvo Pärt, Paul Scoenfield and Augusta Read Thomas. On June 4, the premiere performance of the latest commission, a setting of Revelations by James MacMillan will take place at Rockefeller Chapel, performed by the Rockefeller Chapel Choir and the University of Chicago Motet Choir. With the last 30 years of being inundated with Baroque-style performances and practices, historically informed playing of Baroque music is pretty much a given by most musicians even among those in symphony orchestras who perform on “modern” instruments. But what Nelson often finds lacking in contemporary performances of Bach’s choral masterworks is not an inability to handle the technical aspects of Baroque style, but a reluctance to engage with the spiritual essence that is at the music’s heart. “The really, really important thing for me is to enter into the Easter spirit of this piece,” said Nelson. And for him that means to communicate the intimate, story-telling aspect of Bach’s vast canvas. The conductor believes that in today’s professional cultural environment, musicians are wary of engaging in –or even talking about—the spiritual nature of these works. “There are a lot of my colleagues who are a little bit tentative about anything ‘religious.’ And so they play down that aspect of it. In 2012, Nelson will lead Bach’s Saint John Passion in Chicago, likely continuing with the Mass in B minor the following year. And he intends to repeat the cycle, rotating Bach’s three masterworks every Holy Week in Chicago for many years to come. John Nelson will lead soloists and the Chicago Bach Choir and Orchestra in Bach’s St. Matthew Passion 7:30 p.m. Wednesday at St. Vincent de Paul Parish, 1010 W. Webster in Lincoln Park. sdgmusic.org; 630-984-4300. The performance will also be broadcast live on WFMT.